The International Astronomy Olympiad is an annual scientific competition for high school students (age 14-18) that emphasized the role of astronomy and scientific knowledge in educational process, as well as their important role in development of modern science and progress of mankind. Established in 1996, the Olympiad has proven to be a very big and successful international event that allowed thousands of participants show their knowledge and intelligence, travel around many countries exploring cultural diversity of the World, and enjoy competition in the spirit of fair play. The International Astronomy Olympiad was founded in 1996 by the Eurasian Astronomical Society as one of the International Science Olympiads. Since the foundation until present (Summer 2011) Olympiad is coordinated by Dr. Michael G. Gavrilov — Founding Chairman of the International Astronomy Olympiad. The Coordinating Council is based in Moscow, Russia, however the competition events can be held in any city across the world using an observatory, scientific center or university as it's home. The Olympiad takes place each year in the first or the second month of the astronomical autumn that starts with the September equinox on 22 or 23 September. Normally the event lasts for 8 or 9 days. The competition consists of three rounds: theoretical, observational and practical. In the course of the contest participants are expected to solve problems that are based on classical problems of astronomy, physics and astrophysics, demonstrate their knowledge of stars, constellations and other celestial bodies, as well as be able to use the results of their observations to perform data analyses and mathematical computations. 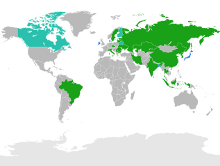 Altogether, the Olympiad has been held 15 times between 1996 and 2010 in 10 cities across 6 countries. Throughout the years it has received participants and guests from approximately 30 independent states with a maximum of 23 countries participating in one year. The total number of people who have visited the contest is believed to be more then two thousands. In 2011 the International Astronomy Olympiad is held for the 16th time in Almaty, Kazakhstan on September 22-30. Learn more about the 16th Olympiad. For further information about the International Astronomy Olympiad, please, refer to the official "Introduction to the IAO in English" on the Organizing Committee website. Some additional information and the list of dates and locations of all passed and future Olympiads can be found in the competition entry in the Wikipedia, the free encyclopedia.